In 1998, the Sundanese numbered about 33 million, most of whom lived in West Java. An estimated 1 million lived in other provinces. The 1990 census found that West Java had the greatest population of any province in Indonesia with 35.3 million people. In addition, the urban population stood at 34.51% , a truly significant number who could be reached with various media. Despite this, the Sundanese are one of the least known people groups in the world. They are often confused with the Sudanese of Africa and their name has even been misspelled in encyclopedias. Some spell checks on computer programs also change it to Sudanese. This short history of pre-20th century is intended to introduce you to the Sundanese of West Java, Indonesia. In this century, their history has been intertwined with that of the rising nationalism which eventually became modern Indonesia. 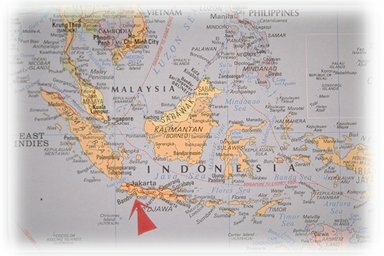 No one knows just how or when Hindu patterns began to develop in Indonesia nor who brought them. It is agreed they came from India; probably from the southern coast. But the character of the Hindu presence in Java raises more questions than it answers. The main Hindu centers, for example, were not in the coastal trading cities but rather inland. It seems clear that religious ideas rather than armies conquered the indigenous mind. One theory holds that the power of the Hindu/Indian rulers attracted Indonesians to the spirit-magic beliefs of the Hindu religion. Somehow many aspects of the Hindu belief system permeated the mind set of the Sundanese as well as that of the Javanese. The oldest known Sundanese literary work is Caritha Parahyangan. It was written about 1000 AD and glorifies the Javanese king Sanjaya as a great warrior. Sanjaya was a follower of Shivaism so we know that the Hindu faith was strongly entrenched by AD 700. Oddly enough, about this time a second Indian religion, Buddhism, made a brief appearance on the scene. Shortly after the Shivaist temples were built on the Dieng plateau of Central Java, the magnificent Borobudur monument was constructed near Jogjakarta to the south. The Borobudur temple is the largest Buddhist monument ever built in the world. It is thought that Buddhism was the official religion of the Shailendra Kingdom in Central Java from 778-870. Hinduism never faltered in other parts of Java and continued strong until the 13th century. A rigid class structure developed in the societies. The Sanskrit influence was widespread in the languages of the Java peoples. The idea of divinity and kingship blurred so that they became indistinguishable. 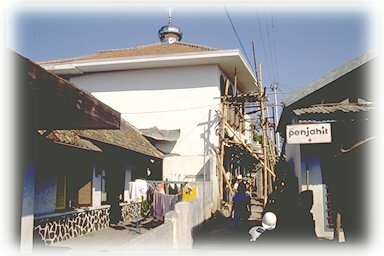 In 1333, the kingdom of Pajajaran existed near modern day Bogor. It was subdued by the Javanese kingdom of Majapahit under the famous prime minister, Gadjah Mada. According to the romantic tale Kidung Sunda, the Sundanese princess was supposed to be married to Ayam Wuruk, king of Majapahit. However, Gadjah Mada opposed this marriage and after the Sundanese had gathered for the wedding, he changed the conditions. When the Sundanese king and nobles heard the princess would become only a concubine and there would be no wedding as promised, they fought against overwhelming odds until all were dead. Although enmity between the Sundanese and Javanese continued for many years after this episode (and may still continue), never-the-less the Javanese exercised influence on the Sundanese. There was a Muslim presence in the archipelago as early as 1100 but there was little Islamic growth before Malacca on the Malay straits became a Muslim stronghold in 1414. 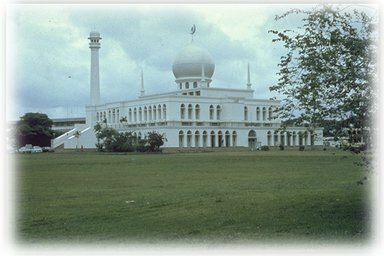 Aceh in North Sumatra began expanding its Islamic influence about 1416. Muslim scholars push the date of Islams advent in Indonesia back almost to the time of Muhammad. But some of the incidents they record were probably not significant. By the time the Dutch arrived in Indonesia in 1596, Islam had become the dominant influence among the nobility and leadership levels of Javanese and Sundanese societies. Simply put, the Dutch warred with Islamic power centers for control of the island trade and this created an enmity that extended the Crusades conflict into the Indonesian arena. In 1641, they took Malacca from the Portuguese and gained control of the sea lanes. Dutch pressure on the kingdom of Mataram was such that they were able to wrest special economic rights to the highlands (Priangan) area of West Java. By 1652, large areas of West Java were their suppliers. This began 300 years of Dutch exploitation in West Java which only ended with the advent of World War II. During the first 200 years of the Dutch rule in Indonesia, few of the problems were linked to religion. This was because the Dutch did practically nothing to bring Christianity to the indigenous people. Until 1800, there was a company church which was a church only in name for it served only the needs of Dutch employees of the East India Company. The Company administered all Dutch activity in the Indonesian archipelago. There were no schools for native children until well into the 19th century so the people had no way to hear the gospel. gives the Javanese as an example of a people group who have a clear identity in contrast to the Sundanese who lack one. Religion among the Sundanese is like their other cultural forms. In general, it mirrors that of the Javanese. The important difference is a stronger attachment to Islam than one finds among the Javanese. Although this attachment is not as fierce as that of the Madurese or Bugis peoples, it is important enough to merit special attention when one looks at Sundanese history. In the worship of these deities, systems of magic spells also play a major part in dealing with various spirit powers. One such system is Ngaruat Batara Kala which was designed to elicit favor from the god Batara Kala in thousands of personal situations. People also call on numberless spirits which include those of deceased people as well as place spirits (jurig) of different kinds. Many graves, trees, mountains and other similar places are sacred to the people. At these spots, one may enlist supernatural powers to restore health, increase wealth, or enhance ones life in some way.